TEACHERS and support staff at Nikenbah's Carinity Education Glendyne will strike for the fourth time due to ongoing enterprise bargaining disputes with the Queensland Baptists' outreach school. Last month about eight teachers walked off the job for three hours, increasing the time frame of their previous one-hour strikes carried out in the 14 months since negotiations commenced. Set to begin at 8am tomorrow, it is yet to be confirmed how long staff will strike for. A similar rally will take place concurrently in Brisbane at another school, Carinity Southside. 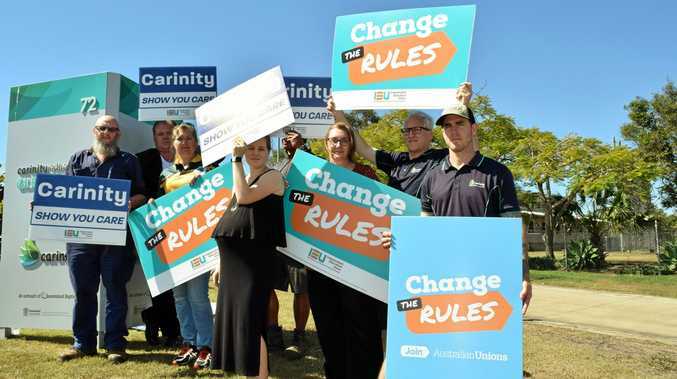 Independent Education Union Queensland and Northern Territory Branch Secretary Terry Burke alleged throughout the negotiations, Carinity has remained wedded to an agenda of cuts to community-standard working conditions including superannuation, long service leave and redundancy provisions. Mr Burke claimed the negotiations had reached a critical point where intervention from the independent umpire was essential. "Carinity has repeatedly refused members' calls to refer this matter to the Fair Work Commission for arbitration, instead hiding immovably behind an agenda of cuts," he said. "Carinity should have nothing to fear from arbitration that will likely result in compromises from both parties to assist in reaching agreement - that is the nature of fair negotiations." Last month, a Carinity spokesperson told the Chronicle the union opposition was "bewildering" as they have been negotiating in good faith. "Staff were in fact being offered an increase in salary of between 8.5 and 10 per cent over the life of the three-year agreement," a statement read.